What is critical reflection for early childhood educators? When you mention critical reflection to early childhood educators you are likely to be met with a deer in the headlights stare and someone immediately asking if it is too early for happy hour at the bar! A slight exaggeration obviously but it is something that many educators tell me they find difficult so don’t feel like you are the only one thinking of an exit strategy when someone asks to see your critical reflections! I’ve shared some tips before on weekly reflections along with the reflection we do when we observe children, analyse their learning and identify how to further extend that learning if we decide it is necessary. But the new buzzword in early childhood seems to suddenly be critical reflection and this is where educators are getting confused and not sure of the difference between everyday reflective practice and the now common term – critical reflection. So I thought it was a good time to break it down into some simple steps and I’m also giving you an action plan you can download to make sure you can get started! Let’s get started breaking it down …. Critical reflection means regularly identifying and exploring our own thoughts, feelings, and experiences and then making a decision about how they fit in with the ideas, concepts, and theories that you are aware of, learning more about or others have been discussing and sharing. The idea is that you are not only exploring your own thoughts, events and experiences that have occurred, but you are also examining them from different perspectives and considering whether this might in fact change your approach or own perspective. It is a way to consistently evaluate your actions and approaches to early learning and an early childhood educator role. Critical reflection is a common practice in many professions to help workers improve, change or reexamine current practice, perspectives, thinking and skills. It is something I have had to do in my work as an educator over the years but also in my family services and project manager roles. The basic premise is the same so it’s not just something that the early years learning framework made up just to give educators like you more paperwork to do (there were other ways they achieved this 😉 ). Reflection shouldn’t (or doesn’t need to!) be about always looking for something you or others might have done wrong though– think about it as being prepared to identify your current values and biases and at least consider and explore a colleagues view that might differ to your own. Discuss with others about how their view influences their own practice in this area and perhaps how you could try a different way of doing something to see what happens. When you are looking more closely at the viewpoints of others your aim is to engage in constructive debate and discussion that allows everyone to see some different perspectives – not to try and change someone’s mind by belittling their views, actions or emotions or put your own point across aggressively without being open to the possibility of some change. 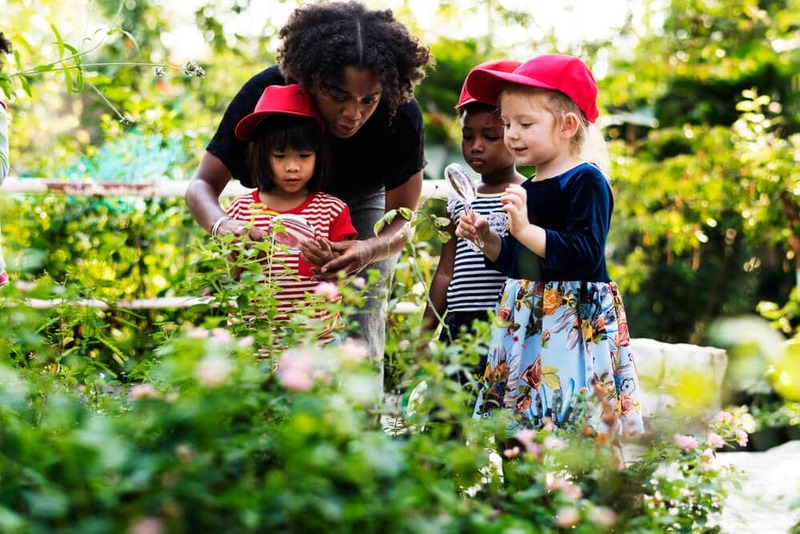 To put it simply – because it helps you as a professional early years educator to make changes and improvements to your practice, knowledge, interactions, actions and learning environments. Critical reflection can highlight for you areas you might like to learn more about, understand better or find different ways to approach that practice. You might use some of the information to add goals and changes that you need to make to your quality improvement plan. You can also use critical reflection regularly to analyse and identify children’s learning and development (as individuals and in groups)to better inform your ongoing planning. We must always try and keep in mind that our reflections and discussions should ultimately lead to the best possible outcomes for the children in our care. Don’t get hung up on just what it means for you – try and keep an eye on the bigger picture and why you are reflecting in the first place! How is it different to my general daily or weekly reflections? 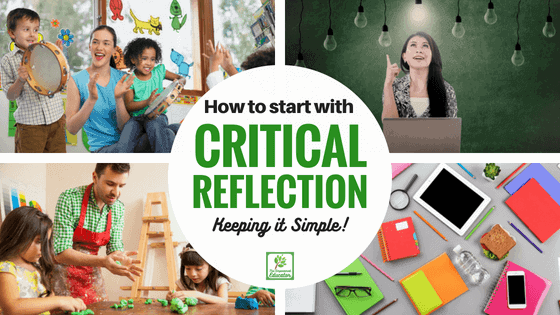 I like to think of critical reflection as going one or two steps further on from your regular weekly reflective practice that you do when you look back on how last week’s program went or make quick notes about an activity or child. The aim of critical reflection is actually to use it as an ongoing tool to build on your current practice and ask important questions not only of those actions, environment and activities – but also of why you choose to do those things that way that you do, how theories and perspectives might have informed your approach, how your actions might have impacted on others and what others viewpoints on this approach or action might be. How often do Educators have to ‘critically reflect? As critical reflection is an ongoing process there are no set rules for how often you should set aside time to document your reflections. To get started taking regular action though you might like to consider 1 or 2 of the questions from my list further down below and then add your answers and thoughts to the end of each week’s planning. 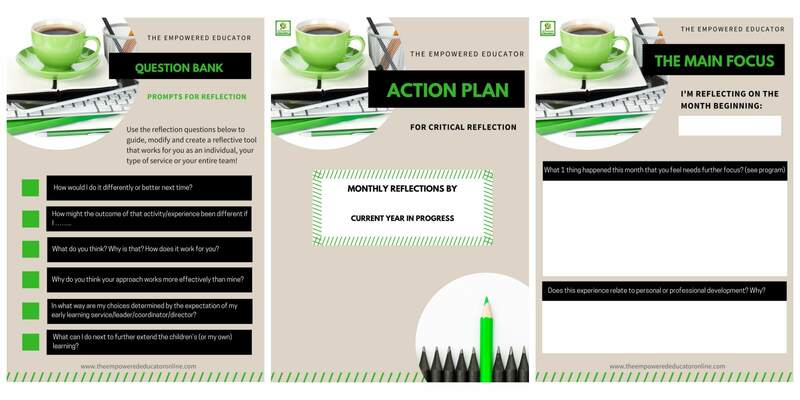 I’ve made this easier for Member Hub Ed’s by adding a critical reflection prompt section to complete in the done for you weekly planners . It can take a little time to learn the skill of critical reflection so by adding a few notes at the end of each weekly program it should help you get in the habit of exploring and learning more about how to use this practice effectively as everyday practice without it becoming time consuming or overwhelming. Some of the questions also help you to involve other people in your reflections and therefore expand and challenge your own thinking. How can I get started with ongoing critical reflection? If you are still a little confused about the process of critical reflection or struggling to begin, try setting aside some time to think about how you might answer 1 or 2 of the following questions at the end of a week before you begin next week’s planning. Think about how your answers to these questions and the discussions surrounding those answers might regularly encourage further learning, help you to gain clarity and inform your future decisions about the children’s learning. 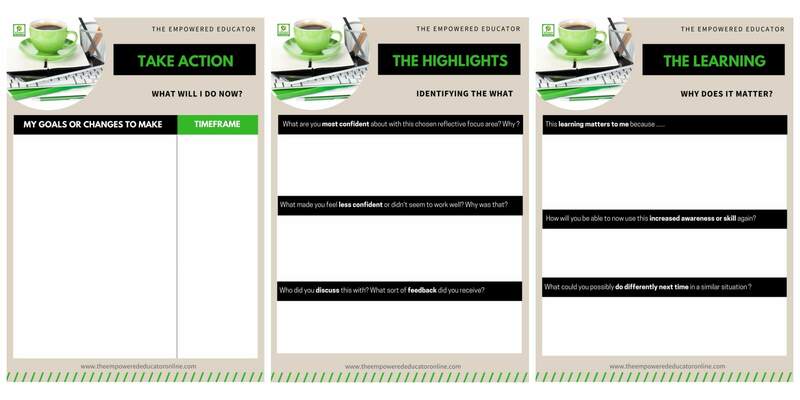 When you have identified your answers to a couple of the questions below you could then use them to begin drawing up an action plan you can revisit and update regularly. This creates a simple yet visible system of ongoing critical reflection without it taking a lot of your time each week! Not sure how to do that? 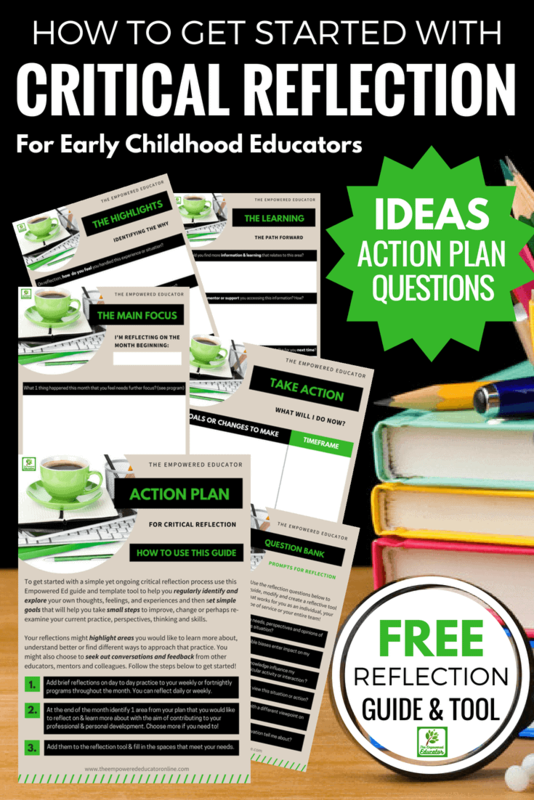 I’ve included an action plan template you can download for free and use to help you get started. Just click or tap and tell me where to send it to you. Critical reflection certainly doesn’t need to be complicated or become something that takes a lot of time but isn’t helpful to you or the children. We just need to keep it simple but do a little bit often! No matter what you might have read online in the groups and forums….it’s not easy for everyone to begin doing straight away and learning to initiate and accept critical reflection is a skill that needs to be continually practiced – just like assertive communication skills. It’s not something you are meant to just ‘get’ overnight or find easy straight away -so instead of pressuring yourself to reflect on absolutely everything to make sure you are doing it ‘correctly’, break up ongoing critical reflection into smaller more manageable steps and begin with one question at the end of your week, add it to your action plan and then take it from there. You might decide to put more effort into exploring just one area you identify from your answers for now and then ask some more specific questions regarding this practice as the year progresses. Questions to prompt deeper critical reflection. How did my own experiences and knowledge influence my understanding and actions of a particular activity or interaction this week? How did I take into account the needs, perspectives and opinions of parents and their children in this situation? Did my personal values and possible biases enter impact on my experiences this week? How do my fellow educators, leader or view this situation or action? What do I need to find out more about? What other theories might provide me with a different viewpoint on this subject? 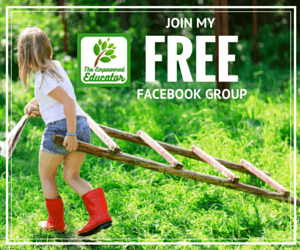 In what way are my choices determined by the expectation of my early learning service or leader? What does this action/environment/observation tell me about? How can I acknowledge, respect and value children’s diverse identities? How could my team members/coordinator/leader/friend help me in this area? Were there broader social and/political or emotional issues that influenced my actions? Did my usual assumptions mislead my practice somehow? What assumptions can I challenge next time? What knowledge did I use to reflect upon observations this week? What did I learn about this? How would I do it differently or better next time? How might the outcome of that activity/experience been different if I ……..
What do you think? Why is that? How does it work for you? Why do you think your approach works more effectively than mine? What can I do next or differently to further extend the children’s (or my own!) learning? Who is disadvantaged when I work in this way? Who is advantaged? to make sense of what I do? What am I challenged by? What am I curious about? What am I confronted by? Are there other theories or knowledge that could help me to understand better what I have observed or experienced? What are they? Choose one of the simple questions below to get started right now and conquer that critical reflection fear! What are you confident is working well in your day to day practice? What have you identified isn’t working well for you? What might you consider changing? How could you find out more about something to make it work better? In what areas would you like to grow more as an educator? I know it can be confronting and we already have so much paperwork to do that this can just seem like a waste of valuable time but without regular critical reflection processes in any profession it can be difficult to grow, to learn new things, to explore different theories and perspectives and to engage in assertive yet constructive discussions with our colleagues. Please keep in mind that it can be a very fine line between a conversation that discusses different perspectives and methods to shaming someone for their own viewpoint or continually arguing that your way is the only right way. One of the goals of reflective practice is certainly to help us improve and make changes but it doesn’t always mean you have to change what you are already doing – you are simply collecting the information you need to make a decision about what you need as you move forward in your role. Perhaps you will find that you are feeling confident and on track with that particular practice, process or direction and can now move on to explore others areas as you ask more reflective questions of yourself and others around you. Remember that you can start small by choosing a question or specific practice each week that you would like to explore further and add your thoughts to the reflection section of your weekly planner then at the end of the month use a simple critical reflection action plan to put some goals, action steps and time-frames in place. This not onlyshows evidence that you are engaging regularly in reflective practice it ideally will help you to increase your knowledge base, skills and above all provide better learning outcomes and experiences for the children’s learning journey. Click to download a free reflective learning action guide to help you start recording your reflective practice and identifying some simple action steps you can take to improve or change your everyday practices. Although you of course don’t always need to write your reflections down (who has that sort of time?) I find it helps sometimes to see our thoughts, day to day practices and questions down on paper or on a screen in front of us to help guide us as to whether we need or want to take further action – don’t overwhelm yourself though by trying to reflect on everything all of the time!! I hope you have found this guide to simplifying and understanding critical reflection helpful. 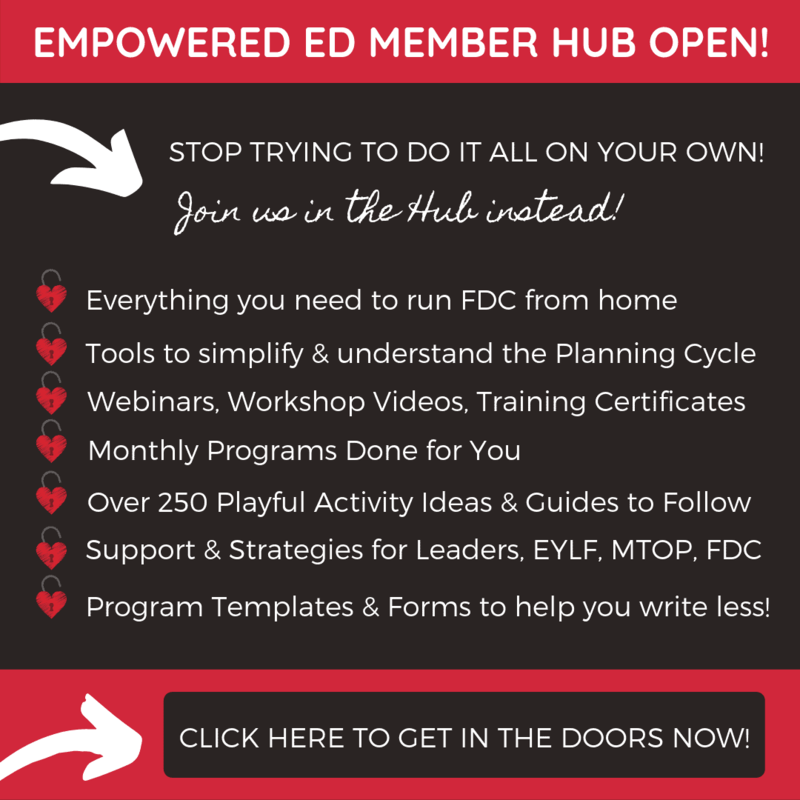 You will find training videos, community discussions, factsheets, weekly planners with reflection tools and more on topics just like this one in the brand new Empowered Ed Member Hub. 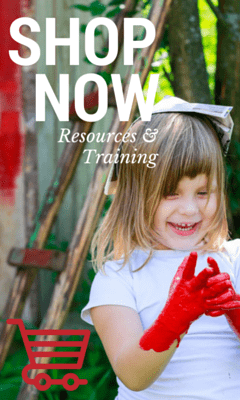 The Member Hub is a safe, supportive and inspirational space online that offers both mentorship and easily accessible professional development for early childhood educators. 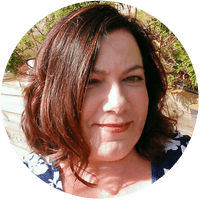 Add your name to the VIP waitlist here to get sneak peeks and free example resources emailed to you before enrolment opens again soon! I really enjoyed your article and would like to extend on and strengthen my knowledge on reflections and documentation. Such an informative article. I want to read more from you. Thank-you for this great article. centre has just purchased an on-line software package that parents are able to logon to this app and see what their child has been doing through out the day. This new software package includes areas where we must critical reflect. 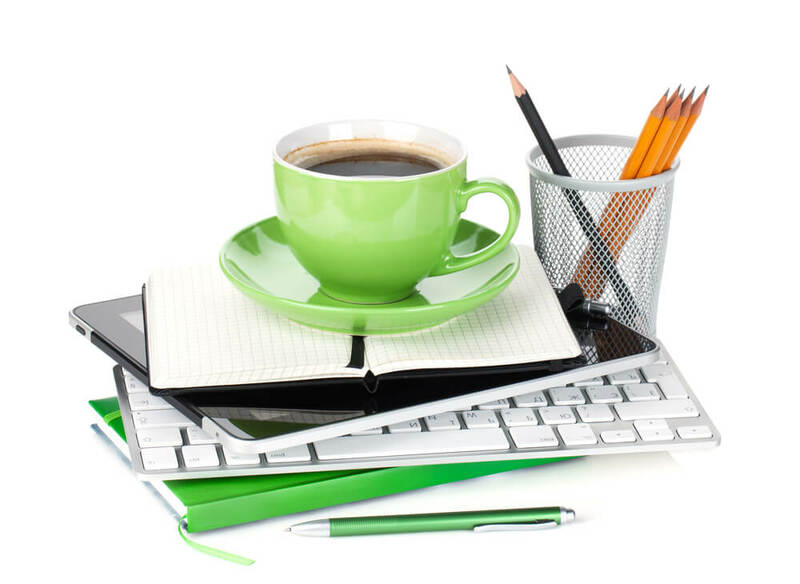 This article will help me de-mystify the different reflections that we are required to write.